Prizewinning and bestselling writer Luis Urrea has written his Mexican coming-to-America story, his masterpiece. 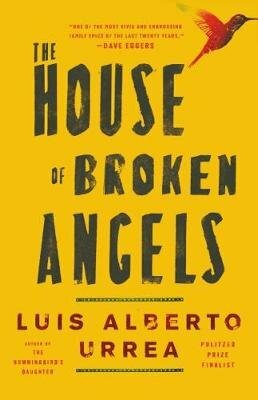 Destined to sit alongside other classic immigrant novels, THE HOUSE OF BROKEN ANGELS is a sprawling and epic family saga helmed by patriarch Big Angel that takes place over the weekend of the final birthday party he is throwing for himself at home in San Diego, occasioned by his imminent death at the hands of that familiar killer cancer. But when Big Angel's mother Mama America passes as the party nears, he must plan her funeral as well, and so decides to throw two family affairs in one weekend: a farewell double-header. Among the attendants is his namesake Little Angel, who flies in from Seattle to pay his respects and say his goodbyes, and comes face to face with the people with whom he shared a parent but as the weekend proceeds to remind him, not a life. This is the story of Big Angel and Little Angel, of what it means to be a Mexican in America, to have lived two lives across one border - and about the ravaging power of death to shore up the bits of life you have forgotten, whether by choice or not. A finely wrought portrait of this deeply complex family, THE HOUSE OF BROKEN ANGELS is purely Urrean: teeming with brilliance and humor, authentic at every turn - this novel cements Urrea as a master truth-teller of the Mexican-American experience.